We’ve been writing about toddler scooters lately, and while they certainly don’t travel fast on their scooters, it can still be dangerous for little ones not properly protected. One wrong fall going down a hill can be very dangerous if your child is not wearing a helmet. Just because your three year old is closer to the ground, doesn’t mean they would be ok falling off their scooter, especially considering how coordinated most scooter riding toddlers are. First off, measure their head. The easiest method is to take a string, thread, or piece of floss and wrap it around their head from forehead to back of their skull at the widest point, then use a tape measure or string to measure their forehead. Every kids head is different, so don’t assume that a helmet for a toddler will fit your toddler. Measure Measure Measure. Some four year old’s will need an infant size helmet and some two year old’s will fit best in a young adult sized helmet. This baby helmet is your best bet for kids under 3 years of age. At 8.5oz it’s extremely light weight, which is a huge plus for young kids. It comes available in multiple sizes and styles, and has a built in visor for sun protection. The helmet has strap guides that makes it easier to put on and off without pinching your childs neck (ask my kids about that one sometime! ), as well as being very easy to adjust. The toddler Giro helmet comes in 4 different styles, “Blue Aviator Pigs“, “Red Duck, Duck Goose”, “Yellow Chicks” and “Pink Bunnies“. The Giro Me2 Baby and Toddler Helmet will fit on kids heads measuring up to 18.75 to 20.5 inches (48 to 52 centimeters). See the advice above about measuring to make sure you’re child doesn’t have a larger noggin than you think! The Cars Kids Helmet is a great bet for boys in that 2-4 year age range, especially if they’re not interested in wearing helmets. 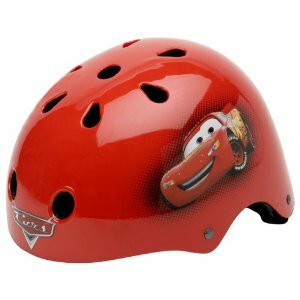 The fact that Lightning McQueen is on the helmet will be enough for most kids to want to put the helmet on. Note that this Cars helmet lists for sizes 18.5in to 20in (47-51 centimeters), and is heavier than the Giro 2 above, clocking in a 10oz, but the Cars look will completely make up for the difference. It also comes with a pair of pads for use on little knees or elbows when learning to ride. 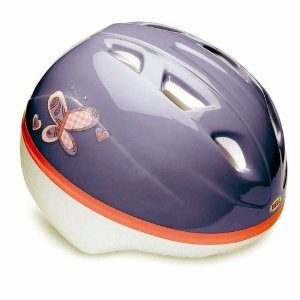 There is also a 5+ year CHILD version of this helmet out there, and most websites don’t specify which you are buying! Be careful. Click here for more info on the TODDLER (age 2-4) version of this helmet. 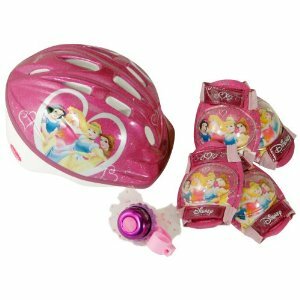 The Disney Princess helmet is designed with the little girl in mind. Not only does it have the Disney Princess crew on it, but it comes with a full set of 4 pads as well as a pink bell. It has a similar size range as the other helmets above, fitting up to 18.5in to 20in (47-51 centimeters) heads. 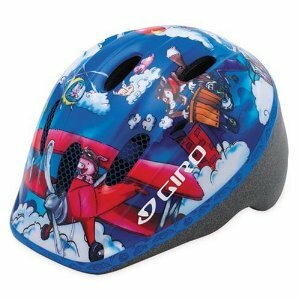 It’s more similar in style to the Giro Toddler Helmet than the Cars one, which follows the traditional skateboard and snowboard style helmets. All of the other helmets above are in the $20-30 dollar range. The Giro is light and feature rich for it’s price, the other come with characters or accessories to add to the value. And really, let’s face it, can you really put a price on your little one’s head? If price truly is an issue, then the Bell Toddler helmet is a great choice. It’s heavier than the other helmets, less stylish, and lacks the pinch protection that others have, but it’s a steal at $12. Note that this helmet does say that it’s for ages 3+, despite it’s similar size range of 19″ – 20-1/2″. The weight is what makes it harder for younger kids to hold their head up, at a full 11.5oz, it’s not light.